As a person with disabilities, I’ve spent years where someone else is caring for me. Now, I have a project where I am able to be the one reaching out to care. I’m so excited to share this brain therapy project, a service dog calendar, I spent 6 months designing that will be able to help others. 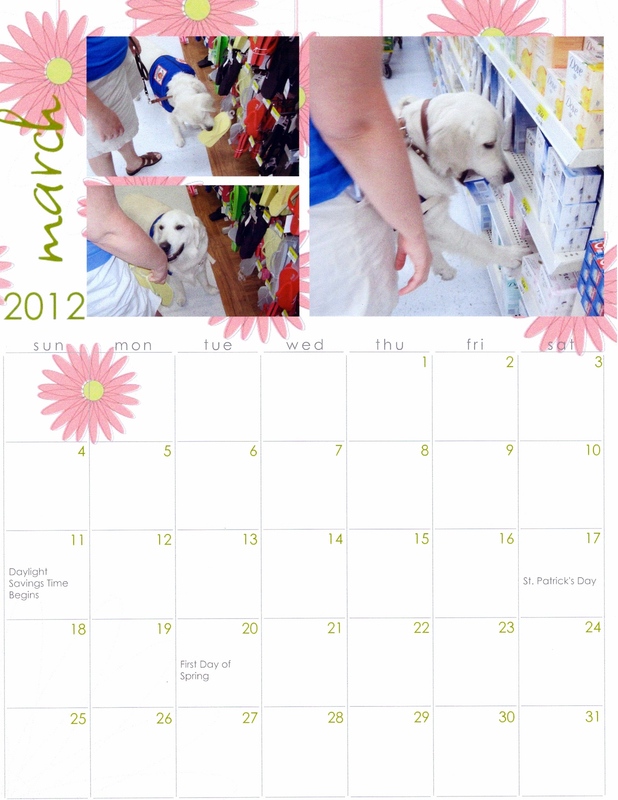 It gives me great joy to raise funds for Paw Pals Assistance Dogs so I can help others via the use of this calendar project. We’d love it if you could help us in our way of caring via ordering a calendar, but we also love all the prayers and words of encouragement sent our way for your words help me to press on so I can care more for myself and for others as I improve. 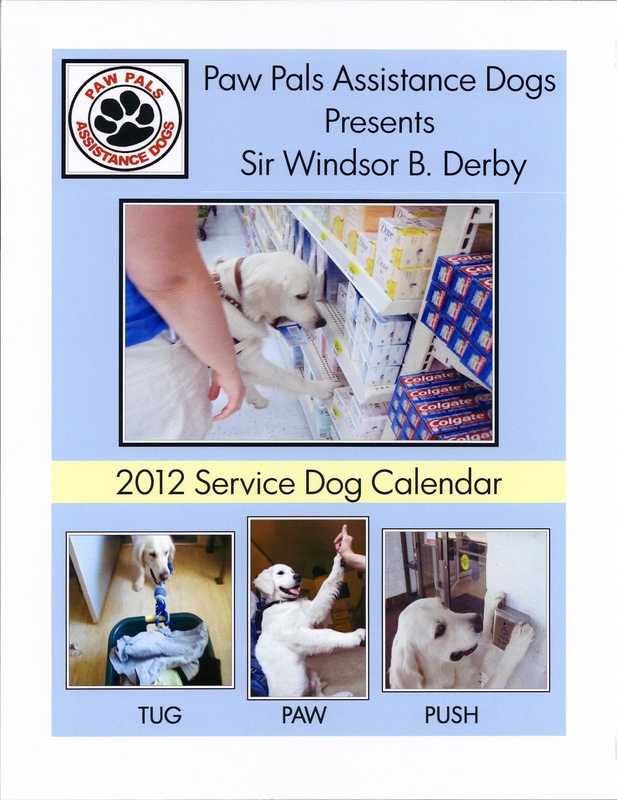 Gift donations of $20 or $25 receive a service dog calendar. 2. On the right side of the “Home” page is a “DONATE” button in black and orange. 3. Click on DONATE & follow the directions to give a gift donation of $20 or $25 via Credit Card or PayPal. 4. Please write “WINDSOR CALENDAR” in the comments section of your donation when paying so that Paw Pals knows where to direct the funds. 5. Then I will be notified by Paw Pals and mail out your calendar. The mailing process is another good brain therapy project for me. They make great gifts for teachers, family members, friends, travel agents, doctors’ offices – including the veterinarian! 😀 Happy scheduling in 2012! 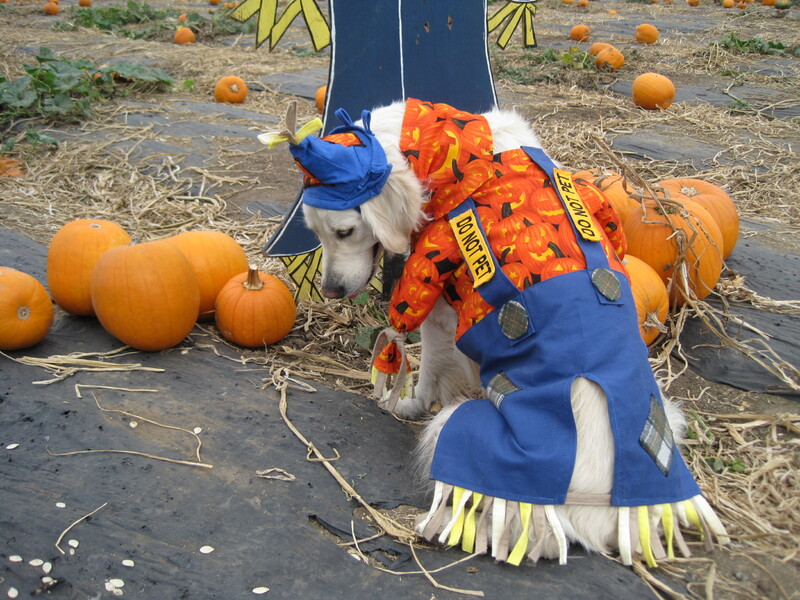 Scarecrow Windsor shows his costume - the patches, the straw, the hat, & the fun of it! He was a great model! I continue to work on different brain projects. For the past two months I’ve worked on creating a “Scarecrow Windsor B.” costume. It’s amazing for me to see the effect sewing has on stimulating more of my brain with creativity, problem solving, and more. Enjoy the video and see what we did! Wow! It has been QUITE some time since I have updated my blog. It is a peculiar thing about brain injuries that what you can learn how to do or remember how to do one day, you may not be able to do the next day, or the next week, or for months again. Such is the case with writing on my blog. Although I’ve done other writing, I forgot how to work here and have not been able to think the “words,” so I just have to relax and not push it until my brain remembers – even if it takes months. I want to share though that I’ve been doing VERY WELL and have been enjoying “Brain Projects” or “NEW BUSIES!” Brain projects are therapy to me and help to recall or retrigger parts of my brain and body into functioning. 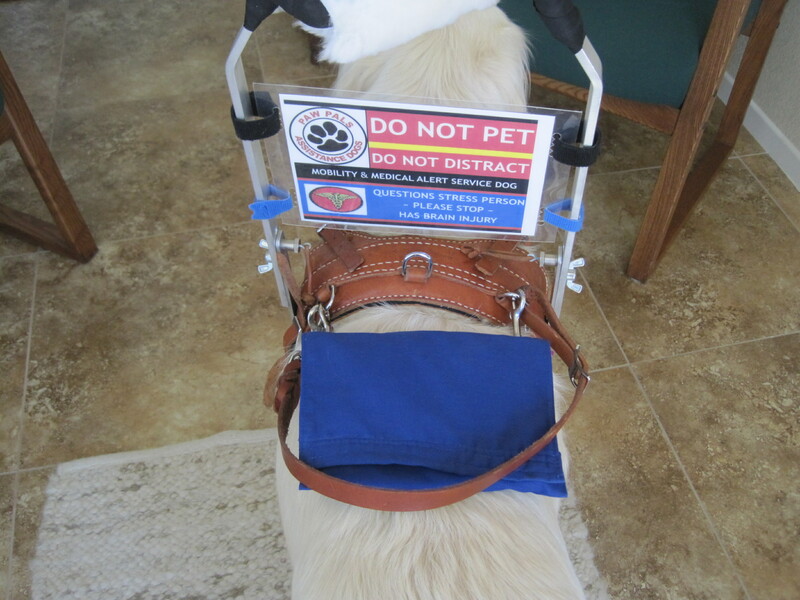 This is the first service dog vest I made for Windsor. It has a bag on each side with pockets in order to carry necessary items when in public. It took months to think it through, some time to make a pattern and cut it out, and six days to sew it. One big new brain project is sewing! I have been growing in learning this skill! Sewing is proving to be another activity that is encouraging alot of brain-work. This therapy is making me use math skills to measure and figure, work small hand coordination to cut/pin/sew, exercise my eye muscle movements, solve problems I encounter, and more. There are times I concentrate for an extended period of time sewing and other times, my concentration is short lived. The feeling of accomplishment is incredibly nurturing for my inner soul. These projects help me to remember what I CAN DO during the moments I’m struggling with what I cannot do. Next month, I hope to show you A DIFFERENT BRAIN PROJECT and a costume I’m making Windsor for the festivities in October. As always, thank you for reading and supporting me in my endeavors to keep striving through the effects of having a traumatic brain injury. 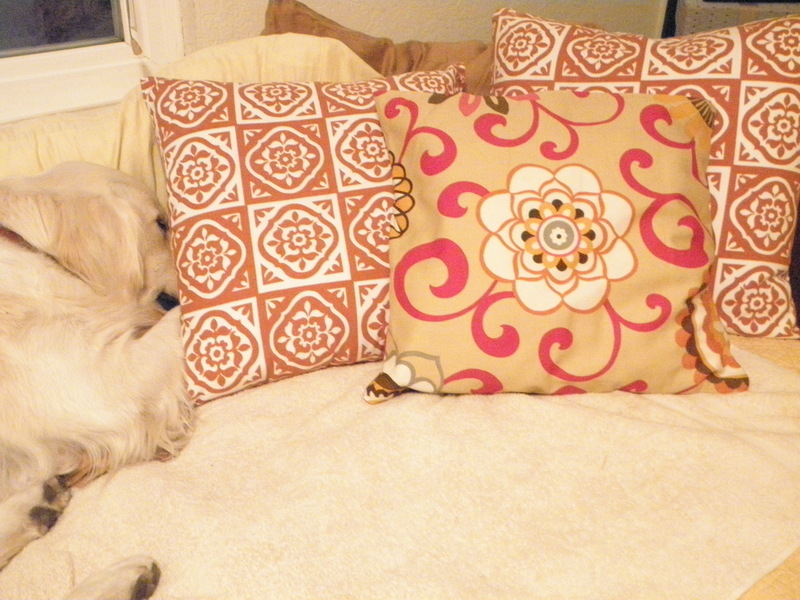 I did not make the cream, fluffy pillow on the left. That is God's handiwork! I made the pillow that is front and center. It was quite the challenge for me to measure and configure so the main attraction flower would be centered. I made two more. 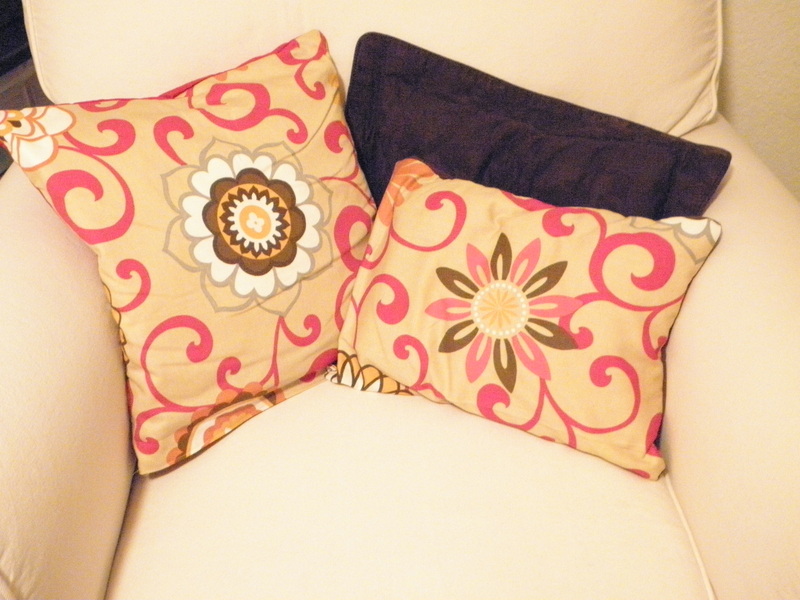 The stuffing in the pillows is bamboo and/or cotton. Due to my special needs, I do not use polyester filling. All material and thread is cotton. 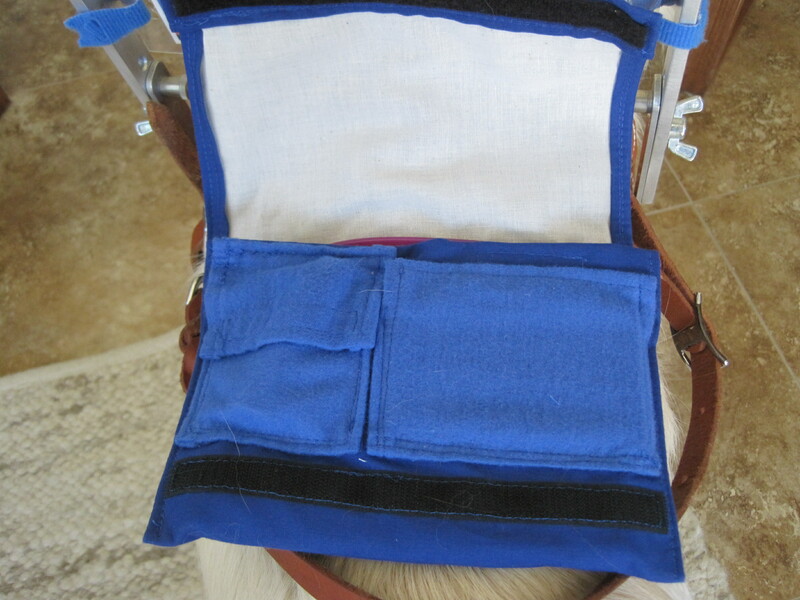 I made a royal blue harness bag. In the left pocket is medicine. 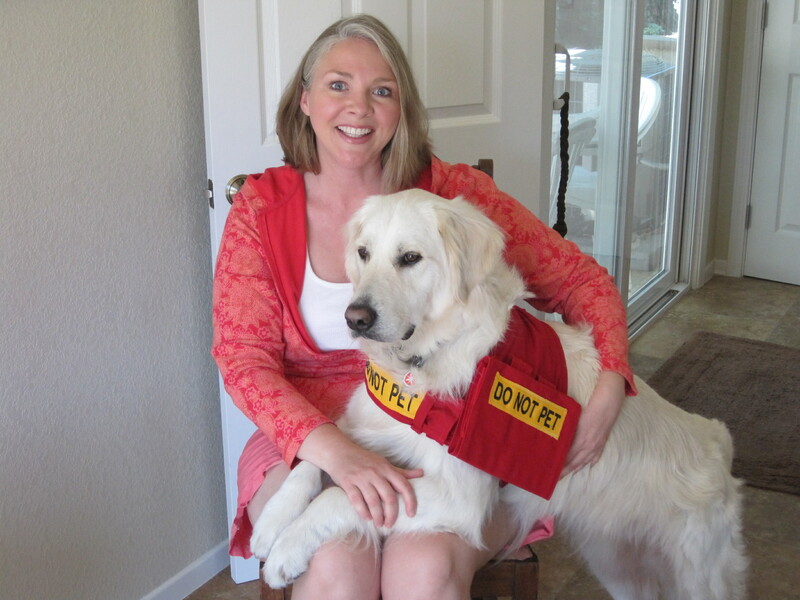 In the right pocket is my emergency medical information and service dog information. In the main pocket, we carry baby wipes, a tug Windsor uses in public (Ex: to pull out grocery carts), and bags to pick up "Windsor's business" in public. This is another vest I made. It's smaller and lighter in material for when we exercise together. Around the "DO NOT PET" patches (letters were embroidered by someone else), I used a serger machine, something I am learning to use. 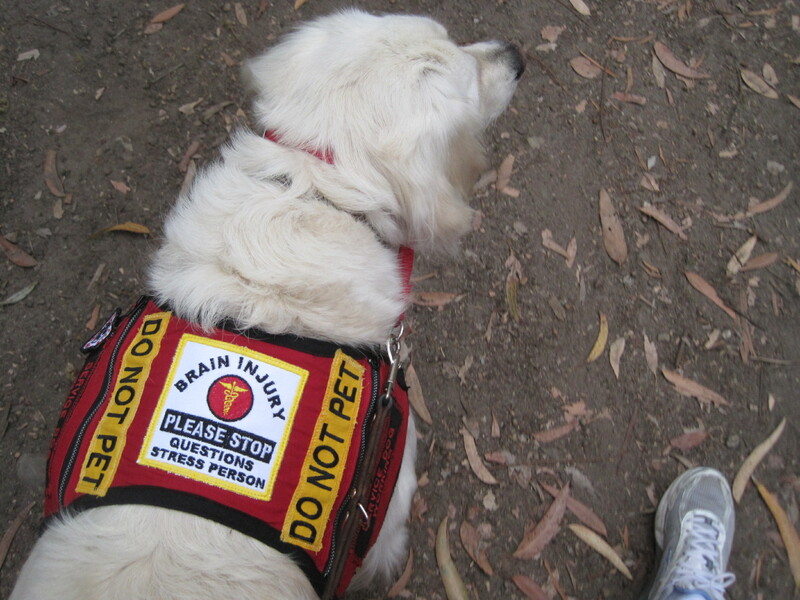 The patch in the center is my BRAIN INJURY patch and says, "PLEASE STOP ~ QUESTIONS STRESS PERSON." This week Windsor had a birthday! He’s now officially an adult dog. I’m still often asked, “Does Windsor ever get to just ‘be a dog’ and play?” This video shows a slice of us celebrating this week’s birthday of turning two as we play with him. It was such a joy to celebrate his turning two and to thank God once again for all the gifts He has brought to me because of this special dog, Sir Windsor, who is so gifted. Thank you to all who supported me with prayer, finances, cheery notes of encouragement, etc. in the “waiting” for Windsor and for so many who continue to do so since Windsor and I have been together as a service dog team. Family Visits! It’s a Lively Zoo! My nephew and Windsor absolutely loved each other! Two years ago, I last saw my brother. By then, I was able to walk and jog a few times a week. We worked out together one time that visit. That was a precious moment to share as brother and sister, something we’d not done for many years. On that walk/jog we talked about our needs, our ways to pray for each other. I shared with him how I felt God was calling me to begin the process of finding a service dog. Since the brain injury, I’ve learned alot about having faith and putting my trust in God when He leads me through what may feel impossible at times. As my brother and I talked, I shared that I had no money for a service dog, I didn’t have the answers as to how to acquire a service dog, I had no idea how God would lead, but I knew He was pushing me strongly into another area to build my faith and trust. 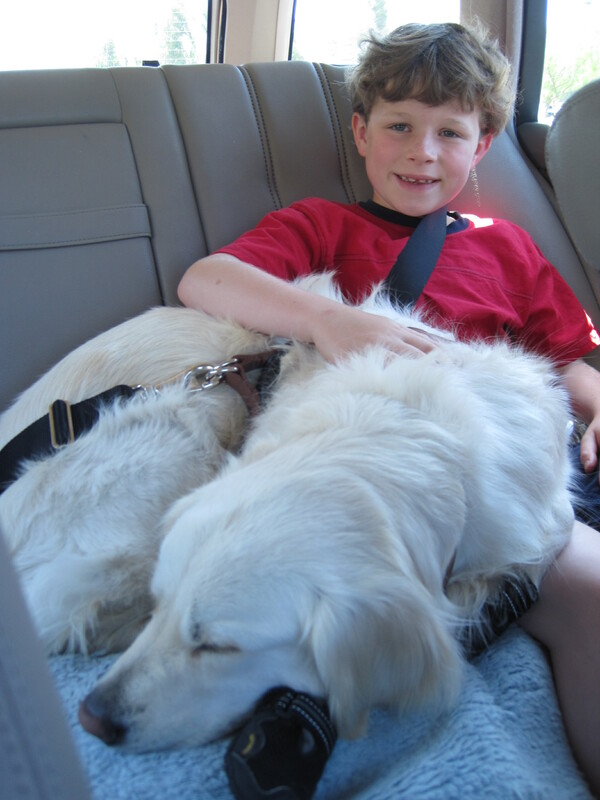 What a grand time that on this visit, two years later, my brother met that service dog that he and I prayed for. 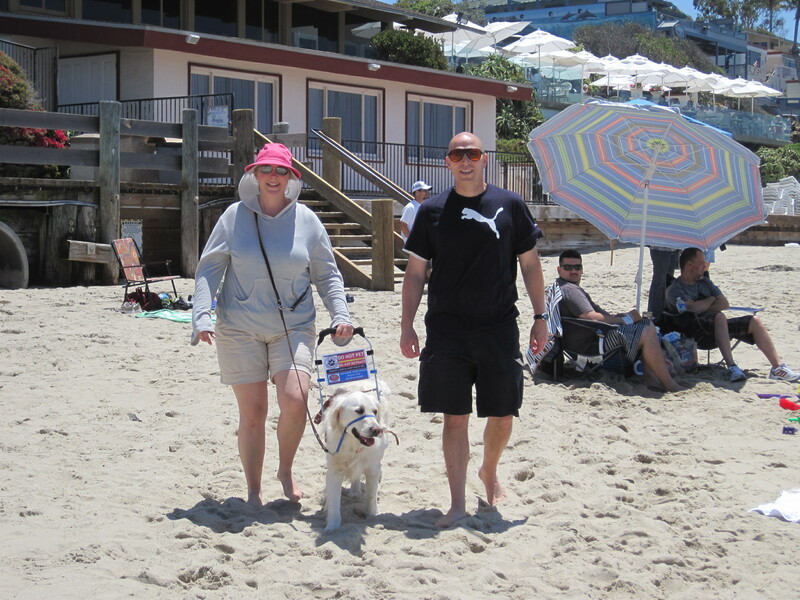 Here we are walking on the beach together (another sign of progress for sand is difficult), all three of us, brother, sister, and the newest family member, Windsor B. Here is a video of my parents, my brother, my nephew, Windsor, and me going to the zoo. I’ve dreamed of visiting this small, local zoo for years for it would mean another AMAZING moment of progress. I’ve wanted to go for the past year, but continued to face obstacles in this brain recovery journey. I’ve loved zoos for years, but it’s a whole new experience going with a service animal! If you’ve never been to the zoo with a service animal, come along and join us! Shopping, Talking, Laughing ~ What Could Be Better? The video below demonstrates some of how shopping is a unique experience for me, but made physically easier with Windsor’s extraordinary help. 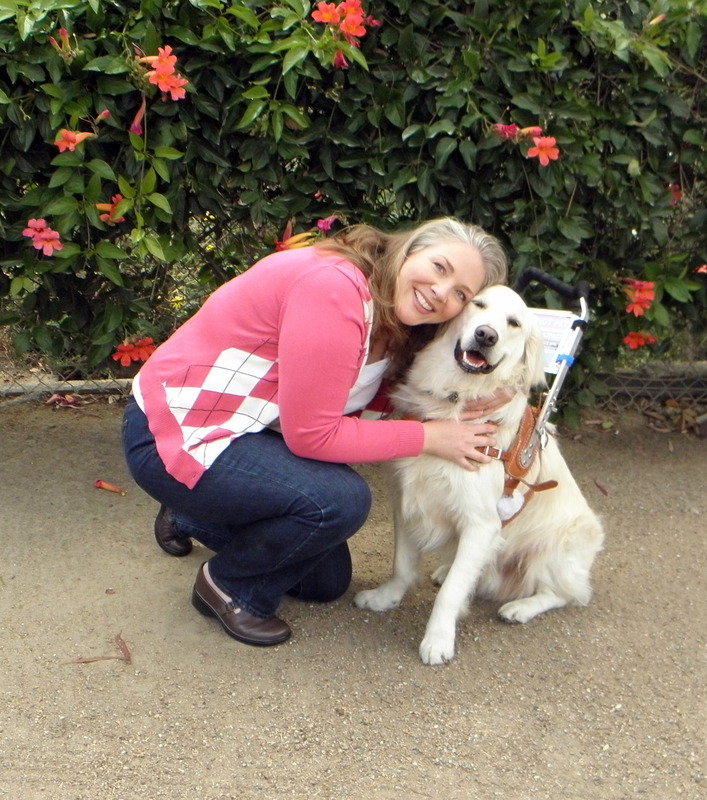 Each video I make is a brain project, a brain therapy for me, releasing my abilities to teach, to use my music, to connect with people, to see the partnership Windsor and I have as a service dog team, to see how I’m growing and healing. In this video, I see my growth, amazing growth in so many areas of my difficulties. realize and see the effort it takes to get past certain words. For me, I see SUCCESS and so much PROGRESS! I remember the Tuesday morning I awakened, almost 2 years to the day after the car accident, to the loss of my fluid speech. EVERY single word or other word was stuttered, exhaustingly stuttered. It was impossible for me to speak, to carry on any sense of conversation. Within a few short months, I lost the ability completely. I was digressing in so many ways and speech was one of the ways my brain declared it could do no more. Years later, after about 7 months on the Brain Protocol, I began to make extended amounts of sounds, horrid sounds I must say, but sounds nonetheless. After 9-10 months, I spoke words repetitiously, practicing and practicing without always stuttering. I still often repeat the same word, phrase, or sentence sounding as if I’m a broken record. You will hear repetition issues in this video. I know the work it’s taken to breakthrough the facial and tongue paralysis issues. I know the stuttering struggle where the word won’t sound, but we laugh at “MY THESAURUS.” “MY THESAURUS” appears when I stutter a word. My mind is searching for a way out, finding a word or words that have the same meaning, but that is a doable, speakable word for me. When it happens, those around me can’t help but giggle at the surprise word(s) change(s). So travel with Windsor and me as we shop, talk, and laugh! Yes, Windsor shops! Yes, Windsor talks quite strongly sometimes! And yes, Windsor has a most definite sense of humor! First You Learn to Walk, Then You Have to Jog! Once the episode passed and Windsor gave me approval to get up and move, we continued our walk. As I began to undaze after the episode, my legs suddenly began to pick up speed. I HAD TO jog, and jog, and JOG! That’s how I respond to the Brain Protocol. A body/brain signal connects and you HAVE to go with it…follow what the body is craving or needing. I couldn’t stop! The wind was beneath my wings. Oh, the feeling was incredible! At one point during this jog, I heard my name being called and saw a woman crossing the street to approach me. She was unrecognizable to me, but I saw tears streaming from her eyes as she told me she subscribed to this, my blog. (Hi Monica!) Somehow, because this is difficult for brain injuries, I was able to stop my task of jogging and communicate with her for a few short minutes. It was a very precious moment for us to meet and hug. She’s been praying for me and saw a significant moment of my progress in the last few months. She’d just witnessed first hand watching Windsor and me jog up a hill! I was a bit disoriented after meeting her because of the change in my “rehearsed” course. I struggle a great deal with this right now, but it’s not uncommon for brain injuries to disorient when an unexpected change occurs in an activity. I was lost trying to recall where I was and how to get home, but I felt peace as I asked Windsor to “Find Home.” Off we went as I followed his lead on the leash and we continued to jog on! Jogging is something I love. I treasure every time it happens and it signals I’m continuing to respond to the Brain Protocol. Having the ability to jog is not something I can expect daily, weekly, or even monthly, but when it happens as I continue to heal – OH, IT’S FANTASTIC!